Under a superb, dazzling sun, the devastated city stretches outward like a cemetery without end. Ruins everywhere… Nothing has been spared; all the churches, schools, and dwellings have been reduced to formless piles of charred stone, among which, here and there, the skeletons of buildings jut up. From east to west, from north to south, all the way to the distant limits of the Turkish quarters, an implacable, ferocious hatred has burned and destroyed everything. Over this deathly wasteland and these immense piles of ash, two minarets, unscathed, rise arrogantly toward the sky. Draped in rags stained with blood and tears, a crowd of widows, orphans, and old people presents itself to us. 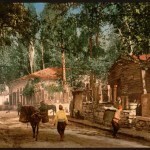 This is all that is left of Adana’s Armenian population. The crowd has the sullen calm of a sea that has fallen still after a big storm; its pain and inconsolable sorrow are hidden in its depths and rise only fitfully to the surface. The hope of living, of being reborn, has been snuffed out in these people. And if hunger and thirst had not shaken them out of their stupor, life would already have been extinguished in them for good. They keep silent for a long time, as if following the thread of their memories, involuntarily carried away by their ghastly course and breathing heartfelt sighs that seem to rip through their breasts: “Aman…” Sometimes they break out in sobs. In an instant, their cheeks are flooded by such an abundance of gushing tears that their words of protest and complaint are drowned out. Then their faces, faces wizened and bronzed by work in the sun, are furrowed by terrible wrinkles and contorted in frightful grimaces, and the whole crowd writhes in despair, prey to a fit of inconsolable grief. It is impossible to imagine what portion of that crowd’s sorrow each particular individual represents. Indeed, it is impossible to grasp or feel the atrocious reality all at once. It exceeds the limits of the human imagination. Even those who experienced that reality cannot give an account of it as a whole. They all stammer, sigh, weep, and recount only disconnected events. 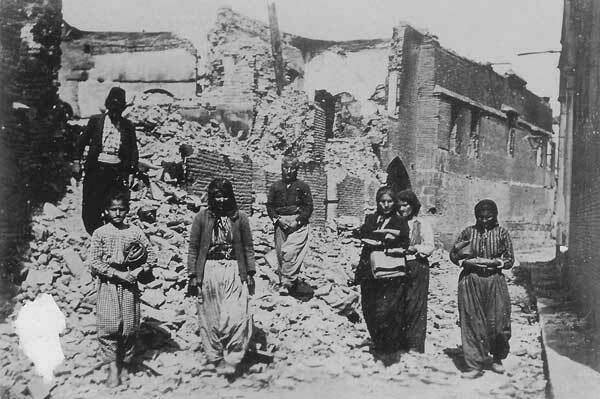 Despair and terror had reached such heights that mothers failed to recognize their children, and crippled or blind old people were forgotten in houses that had been set ablaze. Listening to a savage, bloodthirsty mob’s diabolical, raucous laughter, people lost their minds before dying. Mangled limbs and children’s bodies still throbbing with life and pain were trampled underfoot. Trapped between rifle fire on the one hand and flames on the other, women, children, and the wounded who had taken refuge in churches and schools wrapped their arms around each other as, crazy with fear, they were burned black. 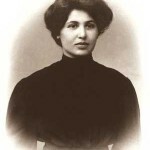 Yet neither those stories, nor the scattered Armenians milling about in those ashes, nor the orphans with their grief-stricken, bewildered eyes and the expressions of children still dazed with terror on their faces, nor the bodies of the bereaved widows writhing over their irreparable loss, nor even the amputees’ painful, still open wounds capture the dark enormity of what actually happened in those hellish days. It is in people’s anxious, terror-stricken eyes that sometimes, for a moment, I think I can catch a glimpse of it. Oh, those eyes! Some appear to have been struck blind and to have renounced the joys of the sun forever; they seem as empty as bottomless chasms. Some look at you without seeing, because one image has been indelibly impressed on their field of vision. Some have preserved the rhythm of the ghastly flames in their gaze. And some, with pupils in constant motion, pupils tormented by haunting scenes of fire and bloodshed, seem to long for blindness and peace. Sometimes they seem indifferent, as if the intensity of their grief had turned them to stone. With calm faces on which not a muscle stirs, they relate the dreadful facts. Every word they utter is spilled blood. 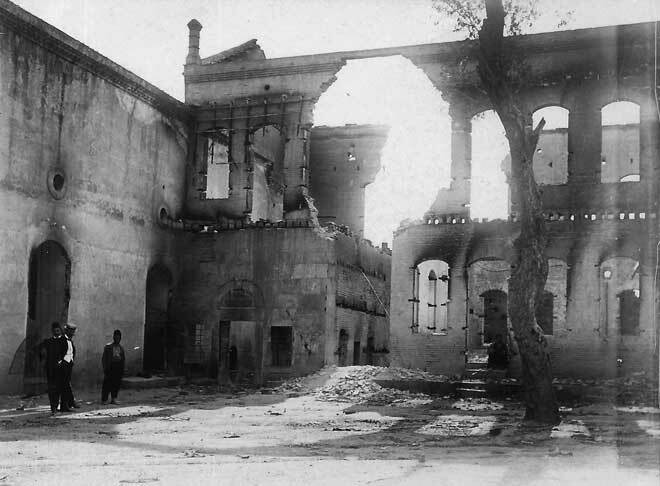 Destruction of the Armenian quarter in Adana. Photo from Armenian Genocide Museum-Institute, Yerevan, Armenia. In this nameless catastrophe, it is not the charred houses or devastated gardens that seem past saving and past reclaiming; nor is it the large numbers of the dead and dying. 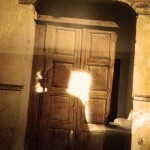 Rather, it is that crippling inner feeling drifting through everyone’s eyes — a feeling of misery, of despondency. It is the feeling of a people that has been trodden underfoot, that has been crushed under the soles of brutes. Heads that, thirsting for light and freedom, had for a moment been lifted in human dignity have been smashed with ruthless cruelty. Tortured by this thought, I look out at the demolished city, whose heaps of charred rubble take on a different and terrible meaning. And yet, amid this sinister desolation and despair, a smile of hope blooms. In the ruins, a group of women has taken refuge in the shade of the partly demolished walls. Suspended between one wall and another, a cradle is gently rocking. Who knows? What the violence of our grief presents as impossible is perhaps possible after all for the people’s untiring, unconscious genius for rebirth. For that wretched child’s humble cradle, indifferent to the immense general calamity and quick with an invincible instinct for life, is rocking above this vast cemetery, perfectly indifferent to both the martyred people’s abject misery and the criminals’ monstrous savagery. 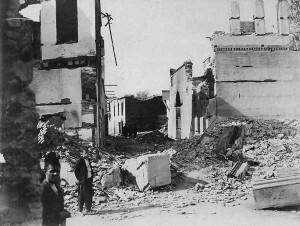 Top photo: Destruction of the Armenian quarter in Adana. From Armenian Genocide Museum-Institute, Yerevan, Armenia.